If the bathroom in your Knoxville, Tennessee, home has seen better days and you’re looking for a way to restore it to its former glory, it’s time to contact 31-W Insulation. 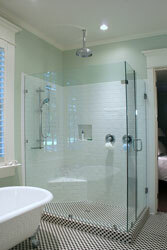 We offer a wide range of high-quality shower enclosures that can give your bathroom an instant facelift. As the premier home improvement company in the area, we’ve been serving homeowners for more than four decades, helping them make their homes safer, more comfortable, and more attractive, and having one of our shower enclosures installed at your home will do just that! We are proud to offer shower enclosures from Quality Enclosures and Coastal Industries, two of the most trusted manufacturers in the industry. These shower enclosures are expertly crafted using 3/8-inch or 1/2-inch tempered glass to offer exceptional durability and a streamlined design. And, with different operational styles, such as fixed, hinged, and sliding, and different aesthetic styles such as framed, frameless, and semi-frameless, there will be no dearth of options for you to select from. No matter which style of shower enclosure you choose, you can trust our team to complete the installation flawlessly the first time and to leave behind a spotless work area when they are finished. When it comes to shower enclosures, we rely exclusively on our in-house team of technicians to complete all installations, allowing us to uphold our lofty workmanship standards time after time. To learn more about the gorgeous shower enclosures we install for homeowners in Knoxville and surrounding areas, contact 31-W Insulation today.